If you're looking for one of the most versatile 24-inch levels you can get your hands on, Klein's 935L has it dialed in. We’re all in the tool trust tree here, so you can admit it: you grab the closest level and just get the job done. It happens all the time – we rarely check it for accuracy, then we throw it back in the box or bag, and we get on to the next project. Probably guilty as charged, right? Me too. But, there’s a world of level innovation out there, and perhaps it’s time to consider it. I think that the Klein 24-Inch Bubble level aims to impress with new improvements particularly geared toward the Pro electrician. Let’s see how it performs. I use a torpedo most of the time, but 2-foot levels are great for panels and larger conduit. If you’re not convinced, The Klein 24-Inch Bubble Level has a few notable features that will try to sway you. You’ll first notice the large, high-visibility level vial. It’s easier to see than most standard vials out there and I don’t have to strain my old eyes quite so much to see it. The Sola level that carpenter Gene Lane recently reviewed also had an oversized vial that he thought outperformed a traditional one, too. In Gene’s opinion, the only missing feature of that level was a handhold. Fortunately, the Klein has one. I might tell him about it… but I really like this one, so he’ll have to get his own! The plumb vial is normal-sized, but sealed in an acrylic block. That’s significant not only for protection but also because it prevents dust from collecting around it. My regular level doesn’t have this block, and the vial gets really dirty. It’s the adjustable vial that takes the cake, though. You don’t often see this type of vial and, when you do, it’s usually on a torpedo. You might not think that’s significant at first. However, it’s great for things like adding to an existing conduit rack where you might normally grab a protractor. You can find the angle with just the level’s adjustable vial. That’s helpful since some guys base their work off of 22.5°, some off of 30°, sometimes 45° in tighter spaces, and they can get even more creative. The vials on this level give you 0.029º of accuracy, or 0.0005 in/in. That matches what we look for as a baseline and what you’ll get from levels like Empire Level. You can get higher accuracy if you want, but only a select number of Pros really need it. You’ll also pay a premium to get it. 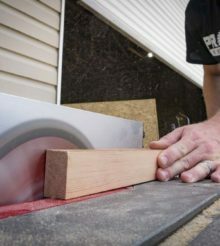 A groove for conduit, as well as strong magnets, make keeping your work in the right place simple. The Klein 24-Inch Bubble Level feels solid without feeling heavy, and the customary rubber end caps protect the whole package. It’s not easy to make an apples-to-apples comparison between the $39.99 Klein 24-Inch Bubble Level and its competition. As I mentioned, nearly all levels with adjustable vials are torpedoes, although the $14 Stanley 42-328M is 48 inches long. It doesn’t have other features that the Klein has, like magnetism or a conduit groove, though. Decidedly professional-quality torpedoes, like the $39 Milwaukee 48-22-5210, or the $18 Stabila Type 70 TMW, have some or all of those features. Empire’s magnetic 24-inch em75.24 without a rotating vial comes in around $35. Ultimately, just under $40 for a feature-rich level with Klein Tools’ name ain’t too shabby when you look at the whole package. The Klein 24-Inch Bubble Level is a remarkably handy, feature-rich level that benefits a number of different trades. The biggest win comes from its adjustable angle vial – something that’s tough to find on other 24-inch levels.